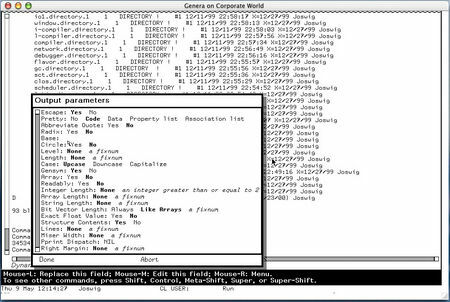 "The video is screen capture of an interaction with a Symbolics Macivory 3 Lisp machine running Genera 8.3. The window is displayed via X11 to a Mac G4, where the interaction has been recorded. 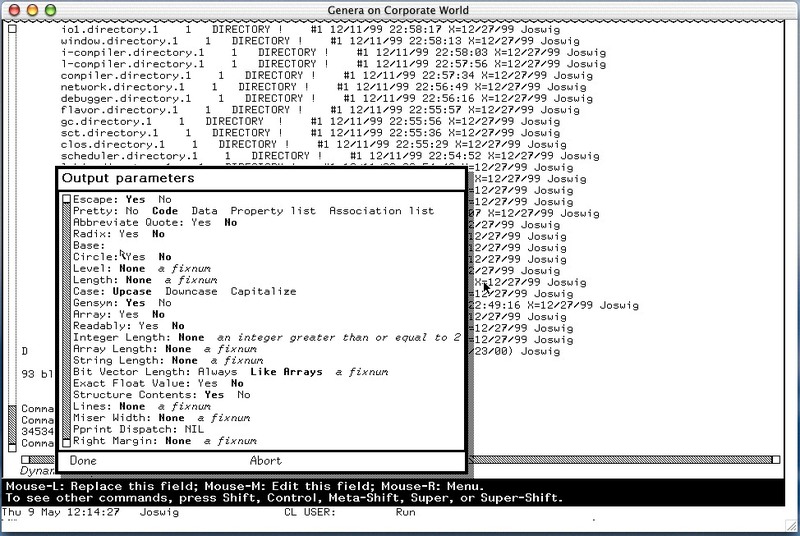 It is similar to the window one would get as a console on the Lisp machine. The interaction is a bit slow due to the screen capture going on. In real usage it is much faster." "Shown are the Listener (used for commands and Lisp interaction), Zmacs (the Editor), the Document Examiner and the Presentation Inspector." Download the video: lispm.mov.gz, 25 minutes, 981x660, 7.5 MB, 50 MB uncompressed. Wow! Did I ever! Not only did I find this awesome video, this site (new to me) shall be a new source of good reading. Thanks! "They were used to produce music videos by Peter Gabriel or animations for movies like TRON." Great, there's more memetics making me confuse Richard P. Gabriel with Peter Gabriel. Well, TRON was rendered in '81~'82 before Symbolics was even incorporated, there is no lisp machine used in any of the CGI in TRON. Most of the CGI was rendered on a Foonly, some kind of DEC-10 on stereoids runing TOPS I believe... was programmed almost in "bare metal" all the graphics were dumped onto a film printer. I think that is right. Recently I read a bit more about it and watched some more of the "making of" stuff on my Tron DVD. It seems that (only) a part of the animations were done in Lisp and not on a Lisp Machine. Though from what I understand the software that has been written for Tron made it later onto the Lisp Machine and probably has been a start for the 3d graphics software from Symbolics. Take it with a grain of salt - maybe somebody can confirm this. Uh. sorry, some of this is correct and some is wrong. I only comment because others have lifted your blog notes as fact. MAGI did the light cycles and that upside down U shaped thing. They did some really nice work (in fortran) because at the time they (accidently) had some of the first ray-tracing code. The business efforts in the Lisp area have failed; people still would like to have similar sorts of environments. There are still some used Lisp Machines out there, and a company called Symbolics may be able to provide Genera software to run on a Compaq/Digital Alpha machine atop what used to be called OSF/1, although contact information is spotty, and pricing is reputedly quite hefty.